About the life of Abu Hurayra prior to his conversion we know nothing other than what he himself said. Having been converted, he became one of the companions of the Prophet. 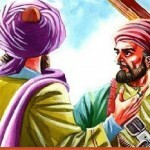 In Muslim’s Fezailus Sahabe, it is said that Abu Hurayra remained in the Prophet’s company and became his servant without asking for any consideration in return. Ibn Hazm says in the Musnad of Baki b. Mahlad that 5374 hadiths were quoted from Abu Hurayra. Bukhari quoted only 446 of his in his book. From the accounts of Abu Hurayra we deduce that the person he feared most was Caliph Omar. The hadith books mention that Omar had threatened and harassed Abu Hurayra because of his involvement in the transmission of hadiths. “If I transmitted these hadiths during the lifetime of Omar, he would surely strike me,” said Abu Hurayra. Had we had the opportunity to see Muslim, we would have asked him the following question: “O Muslim! You have written a book and claimed that all the hadiths in it were authentic and that you screened carefully the transmitters’ accounts. Why did you not notice that Caliph Omar had accused him of recounting falsehoods, and have not found Omar’s indictment convincing enough? This shows that the hadiths that you claim to be reliable are in fact based on unsound arguments.” It is regrettable to observe that Muslim also had taken every one of the Prophet’s companions as a star that guided one in the right direction. It may be because he realized that had he applied a strict screening method to Abu Hurayya’s hadiths, not many would have left. Omar was not the only one who accused Abu Hurayra of lying. We also observe that Aisha, the Prophet’s wife, had accused him more than once, which is mentioned even in the hadith books that stand up for Abu Hurayra.